Brenda was born in a close-knit family short on money, but long on love. From an early age she sought to be noticed and loved to dance for her relatives. They applauded her performances, and occasionally even joked she “looked like a stripper.” Although she had no idea what a stripper was, she realized they must attract attention. Later when kids in her church were asked what they wanted to be when they grew up, Brenda said, “I want to be a preacher . . . or a stripper.” After her family saw a movie about the rapture her dance card included Jesus when they all responded to the altar call. Without money to attend college, Brenda decided her best option would be to follow in her father’s footsteps and join the marines. While in training, she meets a good-looking squad leader and falls in love. Health issues force him out of the military and leave him unemployed. So after the birth of their first child the support of the family is laid on Brenda’s broad shoulders. Her husband remains at home and cares for their newborn while she returns to work. The baby, while under his care, is dropped and the child is left blind and brain damaged. With the care of a disabled son added to her plate, Brenda had no choice but to leave her beloved military career. Eventually her husband finds a job and they decide to add to their family. Brenda is eight months pregnant when her husband adds insult to injury by admitting he’s been having an affair. She packs her bags and she and their son leave. Back in her refuge and safe haven—her parent’s home—she begins a new life as a single mom of two. A new career choice must be made and she decides nursing would help her gain knowledge to continue the care of her son and offer a flexible schedule. Student loans and grants get her back in school, while welfare and food stamps help feed her family. A weekly outing with her mom brings some needed fun, and soon a college football player line-dances into her life–Kurt Warner. 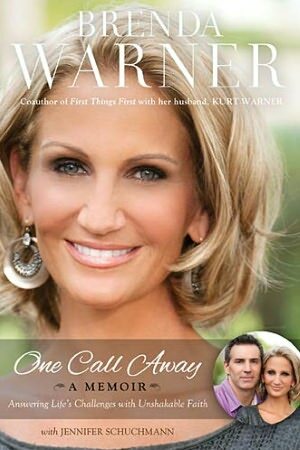 Brenda’s romance with husband Kurt Warner and his fairy tale rise to Super Bowl fame is the fluff that dreams are made of, but inside every dream come true is a back story. As tragedy after tragedy assailed her she clung to the two things she could count on, her faith in God and her parents. Then the unthinkable happens. Both her parents are killed in a tornado. She said, “If the devil was trying to destroy me, if he wanted to take me out, taking my parents from me was the way to do it.” Her final earthly lifeline was blown away. I related to this story and I believe readers will too. How many have had life not turn out as planned? Accidents, broken dreams, and people can all cause us heartache. Brenda’s rags to riches story is a wonderful account of how God works to bring people and circumstances together to redeem and restore what’s been snatched away. Go Team Warner. Enjoy the dance.